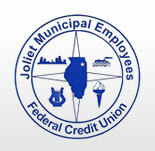 If you are a City of Joliet employee or a family member of a City of Joliet employee you are eligible to join your Joliet Municipal Employees Federal Credit Union. Simply bring an ID and complete a membership application which are available at our office. Minimum opening deposit is $5. No matter the amount in your savings you are an equal owner of your credit union. Credit unions are a non for profit financial institution ran by its members and voluntary board of directors. When your credit union profits, you profit in the form of lower interest rates, higher dividend rates, or added benefits.